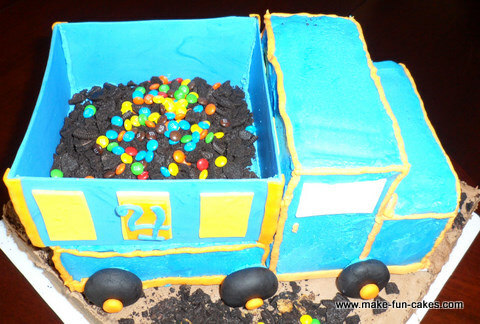 I made this fun dump truck birthday cake for my son’s 4th birthday party. He loves all construction vehicles, especially dump trucks, so I knew he would love this cake. The majority of the dump truck is chocolate cake with the exception of the truck bed, wheels and decorations. They are all made from fondant. 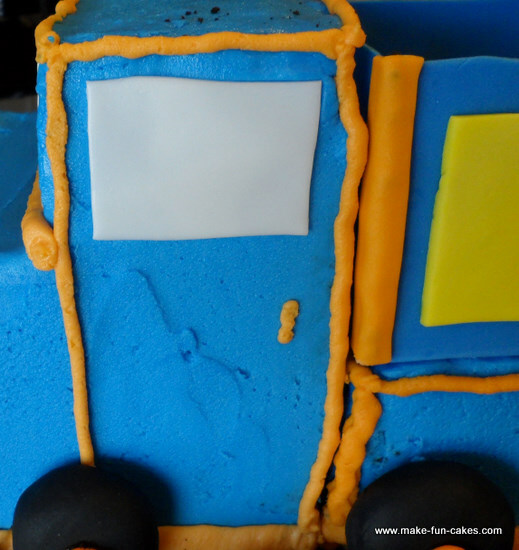 I started the dump truck cake the week before his party so that the fondant truck bed would have time to dry completely. Tint the fondant the color you want your truck bed. Roll out 1/8 to 1/4 inches thick. 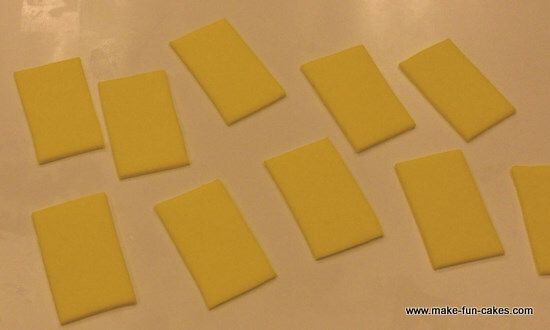 Using the pan to measure the fondant, cut three 6 X 6 inch squares of fondant. Cut two of the fondant squares in half, to make the four pieces which will become the sides of the truck bed. If you want the sides of the bed shorter, trim the pieces. I trimmed mine about 1 inch. Allow the fondant to dry at least 24 hours. It will not be completely dry, but will be dry enough to work with more easily. Prepare royal icing. Tint the royal icing the shade of the fondant. Fill a pastry bag with the royal icing. 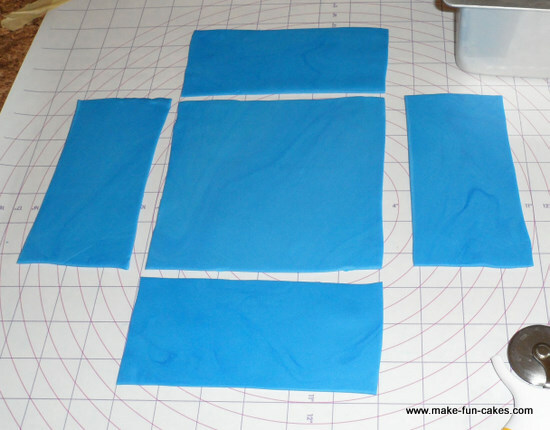 Using a round #5 Wilton tip, pipe icing along one edge of the 6 X 6-inch fondant square. Press the edge of one of the side pieces to this piece, securing it with royal icing. Hold for several seconds until the royal icing has hardened slightly and the sides stay attached. Repeat on opposite side. 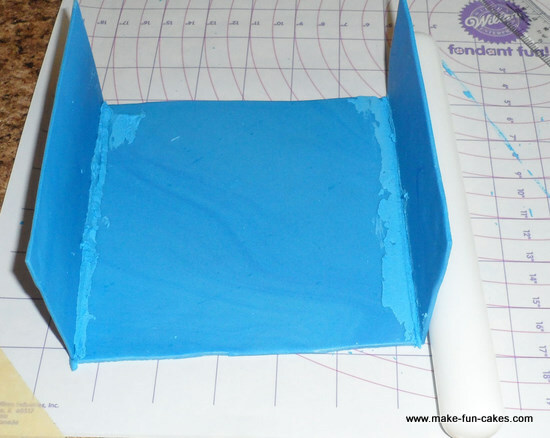 Using the royal icing, attach the other two sides to the truck bed. 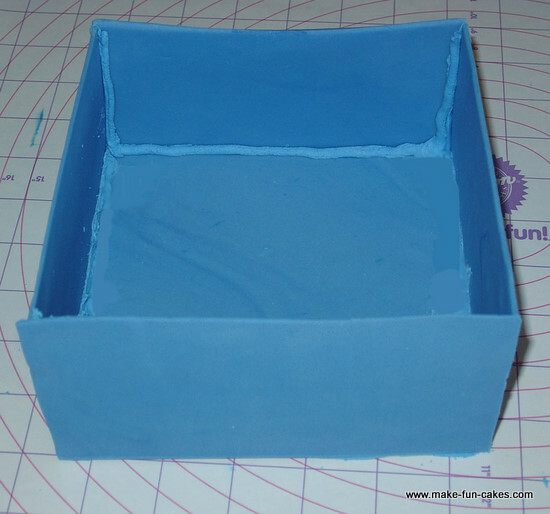 Your fondant will be shaped like a box. Allow the truck bed to dry completely, or at least 48 hours before working with it. Cut out decorations for the truck bed. I cut out rectangles, three for the sides and two for the back and front. I also punched out “4” since that is how old my little guy was turning. I didn’t care for the seams in the truck bed so I covered them with some orange fondant. 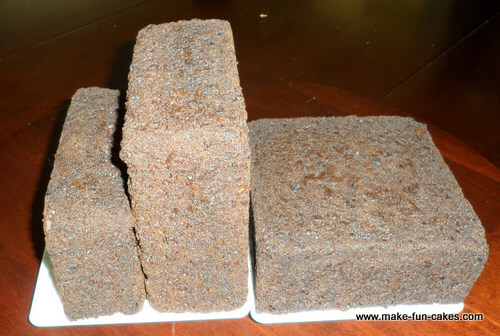 Bake three 6 X 6-inch square cakes. Cool completely. Cut bellies off all cakes. Cut two inches off one of the cakes. Freeze cakes for 2 hours so they are easier to work with. Using frosting, attach the shorter cake to top of one of the square cakes. Set them upright. These cakes will be the front of your truck. Place on cake board. Take the remaining cake and lay it horizontally on the cake board behind the other cakes. This will be the back of the truck. Freeze the cake for at least 15 minutes. Crumb coat frost the cakes. Refreeze. Frost the cake smoothly. Your dump truck birthday cake is almost complete. You just need the final decorative touches. Roll 6 round balls from the black fondant. Slightly flatten each one into a tire shape. Make a round coordinating ball for each tire hub cap. Attach to the black tire with gum glue. Place the cutout fondant in place for the windows, grill, headlights and license plate. Using a coordinating color, outline the truck. On each side add a small line for the door handles. Place the tires in position with frosting. Place the dump truck bed in place. 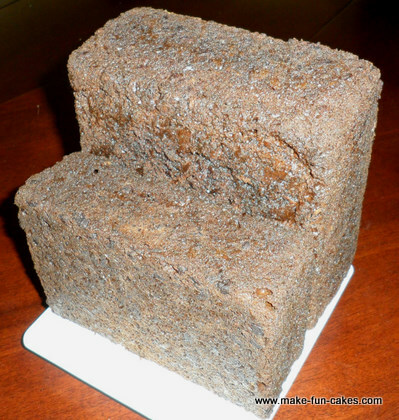 Place the dump truck birthday cake board on a cake plate or on a larger square or rectangular chocolate cake, as I did. I wanted the appearance of a dump truck in the middle of dirt so I sprinkled chocolate cookie crumbs for dirt and M & M’s for rocks. Fill the dump truck bed with chocolate cookie crumbs and M & M’s. 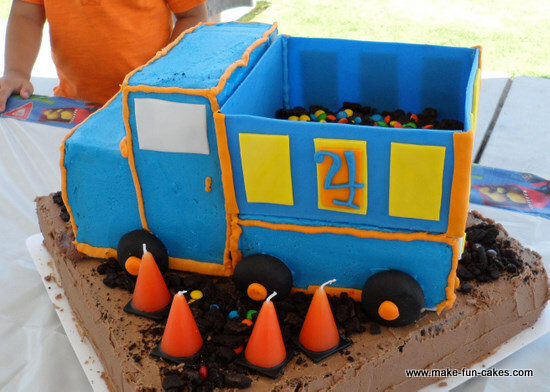 For the last touch, place hazard cone candles next to the dump truck birthday cake. 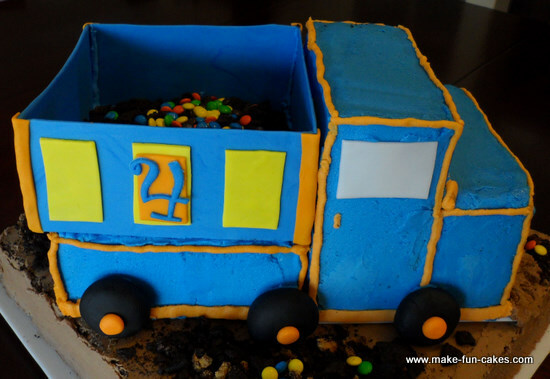 This dump truck birthday cake is rugged, but still cute. 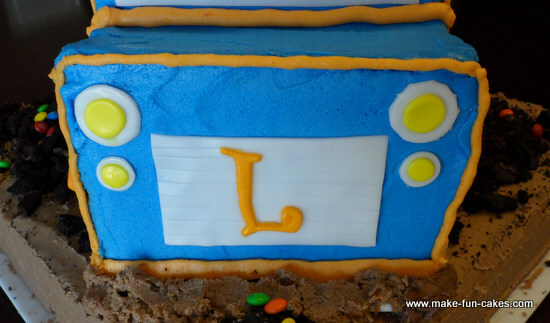 It can be personalized in many ways with colors, shapes on the dump truck bed and building materials. 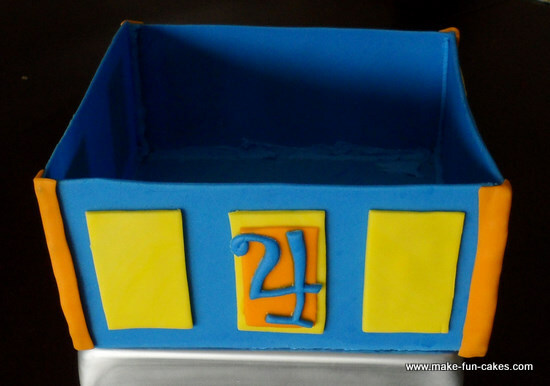 This cake looks great and is an easy enough project for you to complete regardless of cake decorating experience.